I love your “all dogs go to Heaven” and ” all cats go to Heaven” prints. I am interested in purchasing some. What are the prices ? I noticed that this painting was listed under the category “Originals for Sale” but I couldn’t find a price for the 18×24. Could you please let me know what the cost would be if I were interested in purchasing this? How can I purchase “all cats go to heaven”? I am interested in the print “all cats go to heaven.” I lot three cats in two years and would love to have a print. Also, I am interested in a print of the “Beatles” …all you need is love. I saw the art work in the latest Tampa Bay Magazine and fell in love with it. Of course, I have been a Beatle fan since 1964. How much is a small print of “All Cats or Dogs go to Heaven”? Do you have a mixed one of cats and dogs together? If so, how much for a small print. My sister just lost her beautiful cat of 13 years and came across your “All Cats Go To Heaven” painting. I would love to know the price of your painting and would appreciate hearing from you. Thank you for your time and for your beautiful work! 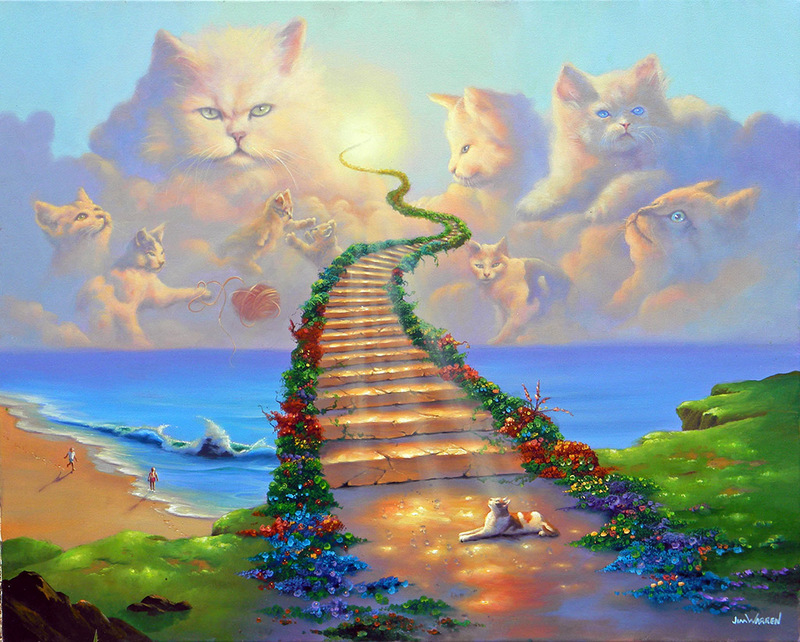 Would like to purchase All CATs go to Heaven. Is there a print or lithograph available? We saw your paintings on our cruise last week (Liberty of the Seas) and Loved All Dogs Go to Heaven. They were trying to get us the All Cats Go to Heaven with No luck. Can you please tell me how we can purchase it and what the price would be since we couldn’t get it on the ship? Thanks and look forward to hearing from someone. After painting “All Dogs Go to Heaven” some people asked if I had one for cats, which I realized then that being a cat lover also, I will paint one. On the limited edition prints I often, on request, paint the names of someone’s pets onto the steps, as they usually buy these in memory of a pet they lost.